ConceptDraw DIAGRAM enables you to create your own templates. You can set up your template as a default DIAGRAM start page. A template diagram is a drawing that serves as a starting point for a new graphics document. The template would likely have a formatted workspace (page size, layout, etc) along with corresponding libraries. When you create similar documents quite often, the best solution saves one of them as a template. Then you won't have to format your documents each time you want to make a new one. Just open the template and start from there. 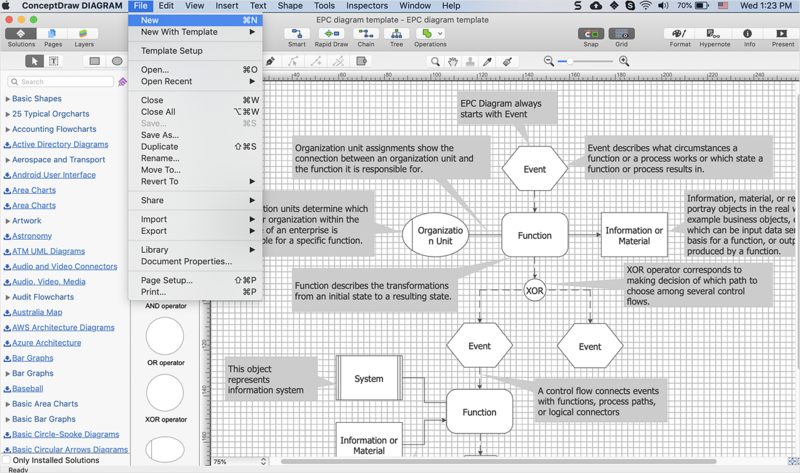 There are several options available for the ConceptDraw DIAGRAM startup page. You can start from a default blank document, from one of the built-in templates, or from your custom template. This article describes how to set your desired default start page. Whether you need to create a new document using one of the built-in templates, use the New with Template option in the File menu. If you want to start drawing with your custom Template, then go to the ConceptDraw DIAGRAM menu Preference (Mac), or Menu File -> Options (PC). Choose the option you need for most of your new documents: Default Settings or Custom Template. Select your custom template from the list of ConceptDraw Templates. Now, you need just select the New option in the File menu to open your preferable template. Result: Now you can start work with ConceptDraw DIAGRAM with a most commonly used template. libraries based on the BPMN 2.0 standard.